This is a new boat for us and we would like any suggestions on covering the port holes in the cabin. One solution. There a variety of tracks out there. Just sew up some curtains.. I purchased a valance for each "porthole" window. 15" length which I thought would be too short, but they are not because the width on them was 56". Honestly? I thought I would have to cut one in half and use it on both windows. No. It gathered up perfectly on my small PVC rod. They are perfect and it looks like I didn't skimp. I don't have a pic. I'll take one tomorrow. 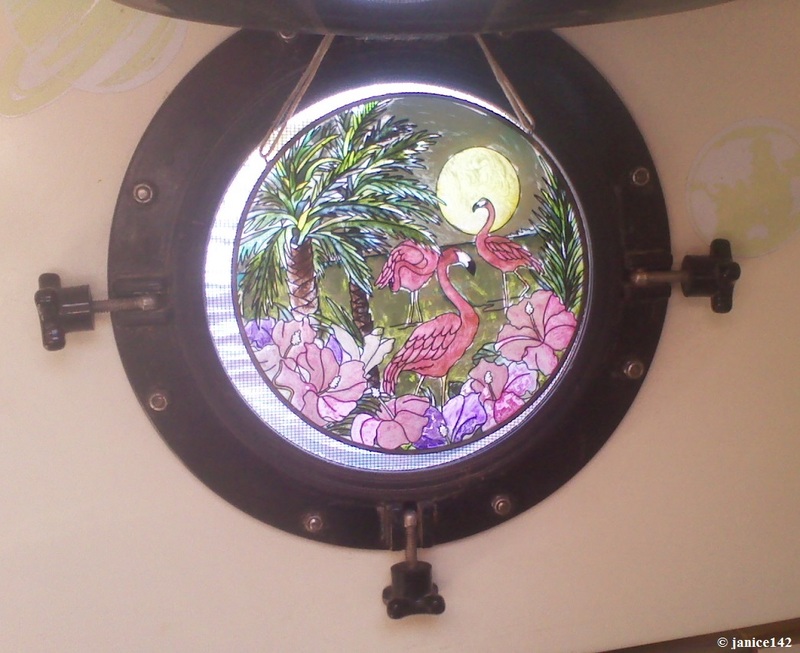 If it is just the porthole you want to cover for privacy you could always sew up some simple curtains like I did. 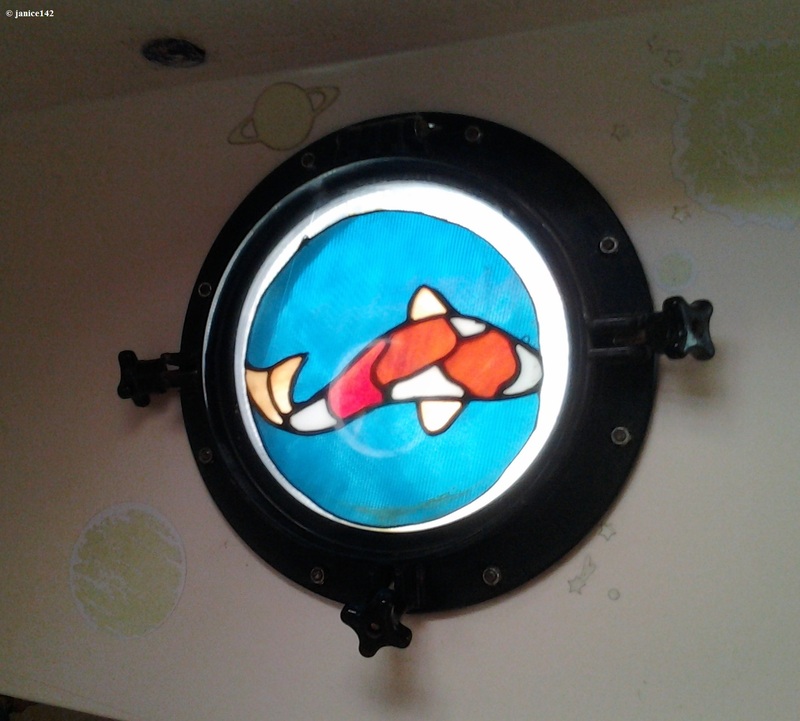 I used 3M self adhesive snaps on the porthole frame and SS snap fasteners on the corners of the curtains. They can be removed for cleaning or if more daylight is wanted, but we never do. On nice days we simply open the ports and have fresh air and light and then close them in the evening. My solution is to use suncatchers in the portlights of Seaweed. They are attached at the top with spiderwire (fishing line) that is almost invisible. 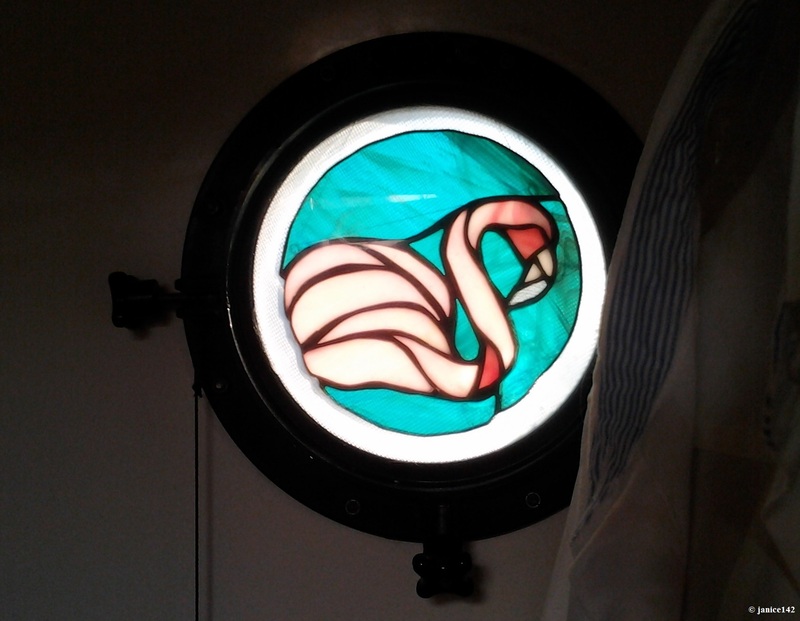 Coming back to Seaweed is so pleasant with the suncatchers and a light on in my cabin. At a dock they afford a level of privacy too. Dock-walkers see the pretty but not behind it. And around the edges I can see out. Originally I'd bought suncatchers from a Hallmark store. Those are plastic and faded in the sunlight. Shocker! I'd ended up repainting them umpteen times. I'm quite taken by her talent. It is exciting to make a boat your own. Enjoy the process. You've got a great platform to work with. That's a nice boat you chose. I hope this works. Not very good with pics. Your cabin is great Donna. Very attractive. My first question would be do you ever open the curtains? If they permanently closed I would go with a piece of opaque plastic that would let in some light but shut out prying eyes. Thin stuff, about 1/8" thick would be light weight. You could use quarter sized velcro buttons at the corners to adhere it to your ports. 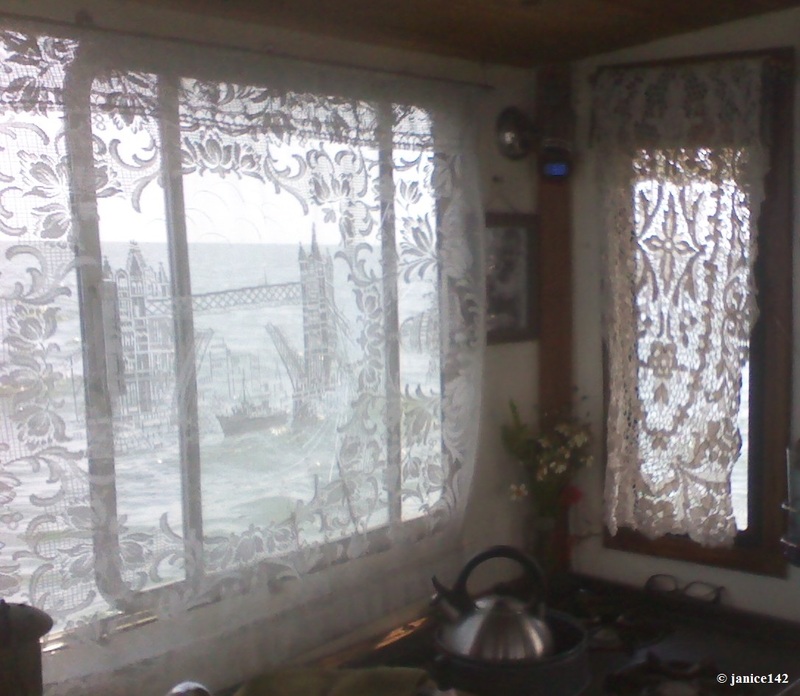 If you want a degree of privacy yet to be able to see out, consider lace. I found some with a nautical motif and use it in my galley over the dinette. It allows me to see out and in the daytime cannot be seen through clearly. At night is a different matter. I have a piece of fabric (hemmed) that I clip (clothes pin) to the top of the lace. It also serves me well when the sun in shining in. On our 40'er we used two layer curtains in the main salon. There was the blackout type with a "prettier" one in front. Same hooks. You've got a great cabin Donna. What you have is a-okay. It looks like coral... visit a fabric store and find some you like better if you want to switch. That's one thing I like about boats. We can change the whole look of a cabin with minimal expense. I switched out the curtains shown above for $2 just the other week. My lace finally was beyond repair. The sun rots stuff. I'm not enthralled with the result to be honest, so I'll do it again when I find a better fabric. Lined (add white to the "back side" would keep your inside pretty from fading. Frankly though by the time something starts to fade I'm ready to "redecorate" so it rather works out for me. I do not line stuff anymore. Having windows for me makes all the difference in the world. I love seeing the world. With the air conditioner off I feel like I am existing at the edge of the world, just me and nature. I like that. It gives me time to paint, read, and relax. For a place to sleep though... well, I'd be interested to know what you chose in the end. For the meantime though your coral fabric curtains look a-okay. I do open them sometimes. I also have mini blinds underneath for privacy. I like to sew, so changing even for the seasons is possible. Right now I am happy with the look. I like your lace. Nice way to filter sunlight. I have a ton of teak as you can see. I think if I did lace it would be out of balance in there. Maybe in my galley!